The fear of public speaking is one most people will admit to. According to Krannich, this is the fear people list as their number one fear, with fear of death being number six. 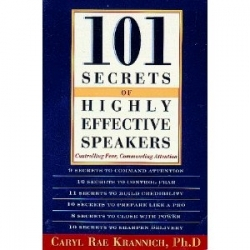 The audiotape explains the 101 “secrets,” which are actually a series of steps, that will help the listener become more prepared for public speaking. These steps list a variety of suggestions on how to improve public speaking preparation and technique. Some of the suggestions are practical advice being repeated in a new way, others are obvious to most individuals, but many are new ideas. All of these ‘secrets’ are read with an added touch of humor by a narrator whose voice is clear and pleasant. The first step in becoming a good public speaker is to know the material and subject matter thoroughly. This seems like obvious advice, but the author demonstrates several occasions when individuals used poor judgment and were not sufficiently prepared. The preparation also means analyzing the audience and having a clear focus and goal for the presentation rather than “tossing” out random ideas and thoughts. Preparation further includes checking the environment for sound, electricity, microphones, stage area and audio-visual equipment, for example. Other suggestions include when and how to tell a joke, an anecdote or a personal story and how to conclude the presentation on a positive note rather than abruptly or with a cliché. This audiobook is loaded with helpful information and is a handy course on speaking in public. The most effective way to utilize it is to listen several times without distractions - perhaps in the car on a long commute to a public speaking engagement.